There are so many things happening in the world today for which I have absolutely no explanation. I’m left feeling like the only way to regain some sense of control is to find the meaning of one of the inexplicable circumstances of our time in a way that is methodical and reasonable, to break it down in simple, digestible terms. Yes, I mean exactly the thing you’re thinking of: how Edubray Ramos managed to, in the first plate appearance of his career, see seven pitches and wind up on first base. I can’t emphasize this enough: This wasn’t just the first at bat of his major league career, it was the first recorded plate appearance at any level of his professional career. There is no evidence of Edubray Ramos standing in a batter’s box since he started playing professional ball in 2010 at the age of 17. You know, when he wasn’t old enough to buy Grand Theft Auto. So how did this happen? 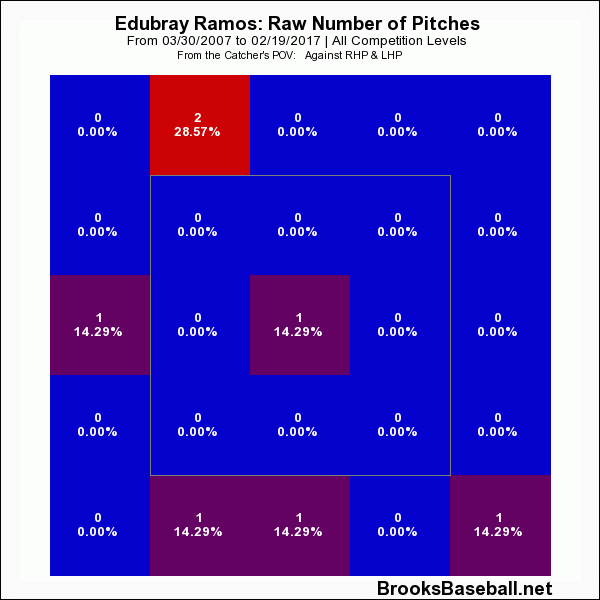 How did Edubray Ramos see seven pitches in a single plate appearance that should have consisted of three unenthusiastic fastballs down the middle followed by a lonely march back to the dugout? Jake Barrett, who was pitching for the Arizona Diamondbacks in the seventh inning of a 6-0 Phillies lead on June 27, 2016, played a part. After allowing hits to Odubel Herrera and Peter Bourjos, he struck out Tommy Joseph but followed up by allowing another hit to Maikel Franco. He threw a wild pitch in the general direction of Cameron Rupp, the next batter. Barrett has, as far as I can tell, had better days. When Edubray Ramos stepped in, it was clear that he hadn’t practiced hitting so much, but had definitely practiced standing far away from things. 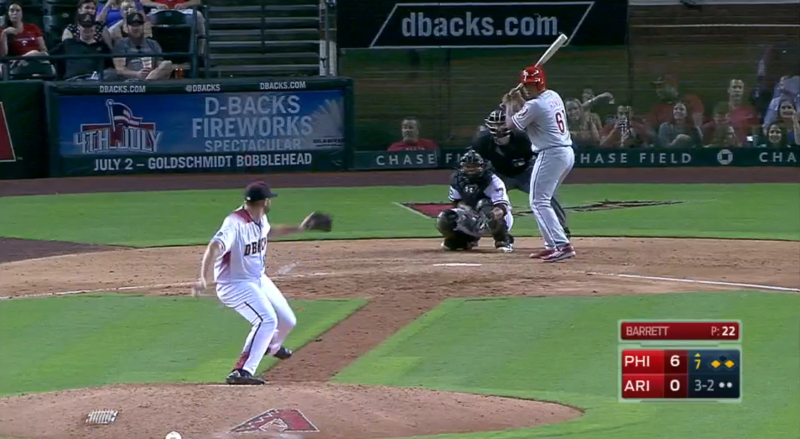 In this screen capture from MLB’s condensed video of the game, Ramos may or may not be behind the batter’s box. He stood there looking at home plate as if it was a landmine that might go off, if it caught him looking at it. Barrett started him off as anyone would: with a heater that hit 95 on the gun. It was off the plate inside, which would seem like an intimidation tactic meant to brush Ramos off the plate if he weren’t already closer to third base than he was to the strike zone. It was a called strike. 0-1. After two pitches missed the zone and Ramos took another strike, the count was even at 2-2. Barrett had Ramos right where he wanted him, assuming where he wanted him wasn’t back in the dugout already. He hummed another fastball – the fifth consecutive – right down the middle, and the unthinkable happened: Ramos swung. Ramos fouled off a pitch to stay alive, if by “alive” we mean in the general vicinity of home plate while holding a piece of lumber that would have been equally functional if it were the steroid-sized turkey legs they sell at Disney World. The next pitch, another fastball, missed the zone, and Ramos asked which way first base was.